A. S. Colyar, who was arrested by a sheriff’s deputy Thursday while waiting to be called as a witness before the Fulton county grand jury, was released from custody by Judge J. T. Pendleton Friday afternoon. Colyar was arrested on a warrant from Knoxville, Tenn., said to be the same warrant upon which he was arrested several days ago by the police. Sheriff C. W. Mangum wired the chief of police of Knoxville to send the necessary requisition papers. 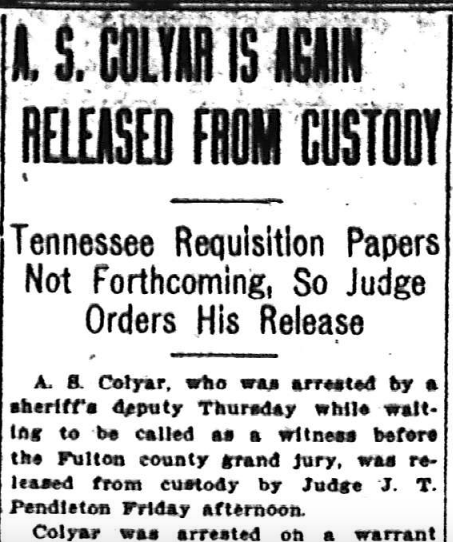 Not having heard from his telegram the sheriff fent [sic] before Judge Pendleton Friday afternoon to whom Colyar had applied for a writ of habeas corpus and stated the facts in the case. 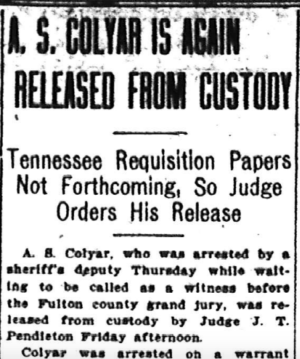 It was then that Judge Pendleton ordered Colyar’s release. Colyar was represented by Attorney John Y. Smith.